Re. Obama & His Making Stuff Up Remarks — What About The Birth Certificate? People just make stuff up. They just make stuff up. We see it in the growth of state sponsored propaganda. We see it in internet fabrications. We see it in the blurring of lines between news and entertainment. We see the utter loss of shame among political leaders where they’re caught in a lie and they just double down and they lie some more. It used to be that if you caught them lying, they’d be like, oh man — now they just keep on lying. On many occasions, lead investigator Mike Zullo has raised questions, against the backdrop of his findings of forgery and fraud, as to Obama’s life narrative and “aliases.” His Selective Service registration form was also found to be fraudulent. What about Obama’s ever changing early life narrative? Greatest political fraud in U.S. history. Click on the image for the evidence about the fraud Obama – The Big Lie! 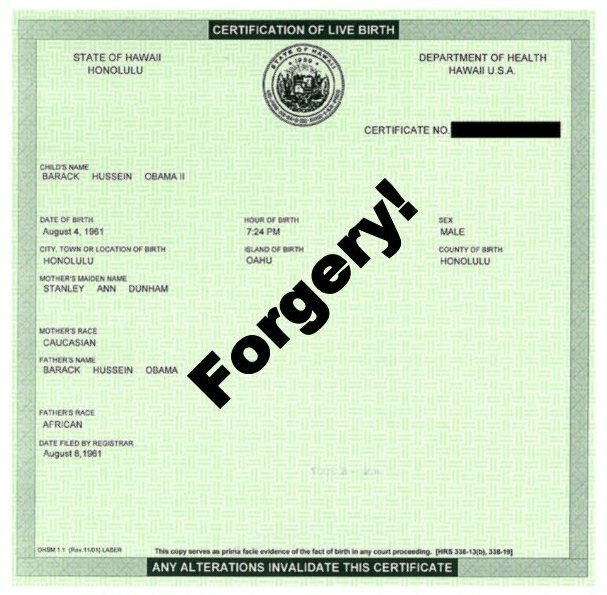 Obama’s short-form and long-form birth documents are both forgeries. Click image. A warning from the past — some conspiracies are very real and are also large and well organized and in process for a long time. Such is the nature of far-left Marxist activities in the USA. 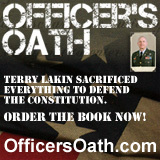 The target of the seditious political conspiracy we are currently faced with is to destroy our U.S. Constitution, our Republic, our culture, and our military. Remember this quote from history: “We must now face the harsh truth that the objectives of communism [now called Democratic Socialists of America] are being steadily advanced because many of us do not recognize the means used to advance them. … The individual is handicapped by coming face to face with a conspiracy so monstrous he cannot believe it exists. The American mind simply has not come to a realization of the evil which has been introduced into our midst.” Quote by: J. Edgar Hoover former FBI director. Source: Elks Magazine (August 1956). 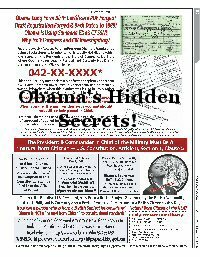 Author cfkerchnerPosted on July 18, 2018 July 23, 2018 Categories Articles/Reports-OtherTags back dated and forged draft registration card, Barack Obama using SSN stolen from a dead person from CT, CDR Charles Kerchner (Ret), Chief Investigator Mike Zullo, criminal identity fraud, ever changing life narrative, forged birth certificate, kerchner v obama, natural born Citizen of the United States, Obama, people making stuff up, presidential eligibility clause, Sharon Rondeau, Sheriff Joe Arpaio, The Big Lie, ThePostEmail.com1 Comment on Re. Obama & His Making Stuff Up Remarks — What About The Birth Certificate? Lead Investigator Michael Zullo Multi-Year Investigation Proves Obama Long-Form Birth Certificate is Forged. Reports Three Letter Agencies Like CIA Involved in Hacking Into Hawaii Dept of Heath Database. Show description: Michael Zullo, formerly the commander and chief investigator of the Cold Case Posse (CCP), a special investigative group created in 2006 in the office of Joseph M. Arpaio, formerly the sheriff in Maricopa County, Arizona will be the guest. Mike Zullo has worked on this case since the begining. This issue of Obama’s Forged ID Documents Is Not Going Away Until It Is Fully & Publicly Investigated by the FBI, DOJ, and Congress. 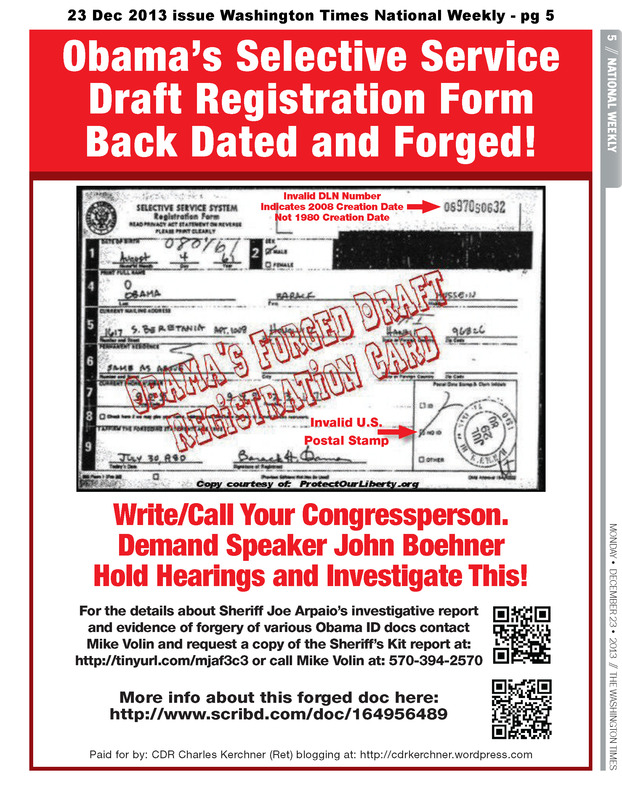 Remember This Full Page Ad Placed in Washington Times National Edition in 2011. All Therein is Still True Except We Now Have to Edit One Word When We Read It. As of Now Change the Word Have to Had — We HAD a Criminal In The White House! A warning from the past — some conspiracies are very real and are also large and well organized and in process for a long time. Such is the nature of Communist/Marxist anti-American activities in the USA. The target of the seditious political conspiracy we are currently faced with is to destroy our U.S. Constitution, our Republic, our culture, and our military. Remember this quote from history: “We must now face the harsh truth that the objectives of communism [anti-American forces] are being steadily advanced because many of us do not recognize the means used to advance them. … The individual is handicapped by coming face to face with a Conspiracy so monstrous he cannot believe it exists. The American mind simply has not come to a realization of the evil which has been introduced into our midst.” Quote by: J. Edgar Hoover former FBI director. Source: Elks Magazine (August 1956). 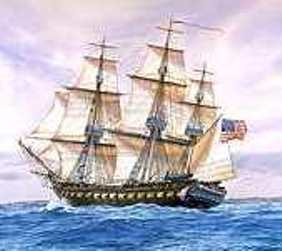 Second segment, “INSTEAD OF ‘RUSSIA, RUSSIA, RUSSIA,’ IT SHOULD BE ‘TREASON, TREASON, TREASON’” LCDR Walter Fitzpatrick (Ret) to discuss Treason within our past and present government.